Coffee and Church: A match made in heaven? 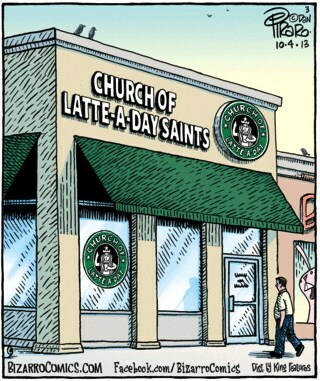 What do you think of Coffee Church? Read this comment from Evangelical Alliance Wales. According to the British Coffee Association’s statistics, the UK consumes approximately 95 million cups of coffee a day. It seems incredible, but apparently 16 per cent of us visit a coffee shop daily and a massive 80 per cent of people who visit coffee shops do so at least on a weekly basis. Coffee festivals are springing up all over the country and just last weekend, the London Coffee Festival alone attracted just more than 30,000 visitors. Gathering in coffee shops and cafès is nothing new. In the 17th and 18th centuries, London’s coffee shops were used as meeting places for creatives, were the hub of many political discussions and were known as centres for lucrative trade deals. Likewise, at the start of the 20th century, Impressionist artists and musicians, as well as the poets of the day, frequently assembled in the coffee shops of Paris. So, just what is it about coffee and coffee shops that have such a pull on our day-to-day lives? They are a perfect place to withdraw from the hustle and bustle of daily life. You’ll be familiar with the scene: you’re grabbing your two-shot-extra-hot-skinny-latte-with-one-sugar-to-go as you run from the train to the office while the more organised people in life are sitting peacefully with a mug in one hand and a book in the other. Truthfully, I’m usually the former rather than the latter. However, on a Saturday morning you’ll often find me alone and away from my phone in a quiet coffee shop trawling through my Bible or working through the prayers and promises in my journal. Jesus Himself knew the importance of withdrawing from the crowds in order to pray (Luke 5:16), to rest (Mark 6:31) and even to grieve (Matthew 14:13). Even the Son of God needed to spend time alone talking things through with His Father and listening to His voice. How much more do we need to do the same? Rather than spending time swiping through our social media accounts as we sip our coffee, could we be using our coffee time to talk to our heavenly Father? They are the perfect place to gather a group of friends. Coffee shops have always been great places to socialise, to catch up with friends, to disciple, to mentor, or to simply ​‘do’ life with others. Jesus ensured that He made time to be around the people He loved, whether that was around a meal (Luke 10:38 – 42; Mark 14:12 – 25), at a wedding (John 2), or as He travelled (Matthew 20:17). In a day and age where so many people feel lonely and without a sense of their own community, who could we be inviting to join us and our friends for coffee? They are an accessible place for the wider community to encounter God. Stepping inside a church building can be incredibly intimidating for the uninitiated. If you have never experienced this for yourself, looking for a new community to worship with when you move house has a similar effect. Many churches choose to host meetings, Alpha courses and other events at their local coffee shops, simply because the venue is less threatening than their usual places of worship. Coffee shops regularly host live music and open mic evenings and are generally very accommodating, provided that we buy some of their products. If our existing venues are intimidating to the un-churched, why wouldn’t we change venue? Let’s bear in mind, though, that many people can’t afford to buy the products being sold at coffee shops, so as we attempt to engage with and minister to those around us, we might also want to consider how we can make these places accessible for them. With 400 billion cups of coffee consumed worldwide per year, it looks unlikely that coffee culture is about to lose its appeal. Maybe it’s time to reassess how best we can tap into coffee culture as individuals, churches and organisations, and utilise these spaces to proclaim the good news? Imagine if the historians of the future wrote that the coffee shops of the 21st century had been used by the church as places to extend God’s kingdom.